Espaçoso apartamento de um quarto em uma comunidade fechada segura. O complexo Seawind on the Bay está situado em um belo jardim exuberante que leva a uma tranqüila frente para o mar. A poucos passos da sua porta é uma piscina rasa para crianças e uma grande piscina para adultos, uma casa do clube, churrasqueira e um bar coberto para o seu entretenimento. Os hóspedes desta propriedade são vizinhos do Yacht Club Montego Bay, do Hard Rock Cafe e do Secrets Beach Club. Eles são fornecidos com um passe que concede acesso exclusivo a esta praia privada e oferece um desconto de dez por cento em alimentos e bebidas comprados no café. O apartamento foi recentemente renovado e tem uma cama king size, juntamente com uma cama queen size sofá (Pull Out). Seu apartamento vem totalmente climatizado e cozinha está equipada com todos os principais aparelhos. Ele ainda possui um pátio fechado / sala de sol que mais parece a piscina e jardim. Algumas das comodidades oferecidas para você são: - Acesso Wi-Fi, TV a cabo e lavanderia na unidade (inclusive de máquina de lavar e secar roupa. Fora do complexo é uma pista de jogging, para o seu início da manhã ou corrida do sol, lá você vai encontrar moradores e turistas. Este é definitivamente o seu retiro de fuga "Idle Time On The Bay" espera por você para umas férias excitantes e relaxantes e para experimentar a calorosa hospitalidade jamaicana. Este complexo é privado, um lugar para se afastar de tudo. Um ambiente verdadeiramente relaxante, romântico e também adequado para famílias. Os hóspedes não ficarão desapontados com este apartamento. Você também está perto da praia, a cinco minutos e também atividades para o seu entretenimento noturno. Super chill time in Freeport! The home looks just like the pictures. Patricia is welcoming and friendly. She answered any questions that I had (before and during my stay) promptly and thoroughly. The apartment is on the bay - watching the cruise ships come in is fun - and you can walk across the street to the public beach. The apartment complex pool is clean and pretty. Plenty of places to lay around and grab sun and read. I hired a driver (Gregory from Native Tours) who took me to Negril (about an hour away) and showed me all the amenities nearby. Fontana Drug, Progressive grocery store, Cafe Blue...you've got to try a Juici Pattie. I'll be back for sure. Thanks, Patricia, for sharing Jamaica with me! Rebecca is just an adorable sweet person, she greeted me with a big smile and one could feel her warmth. She had her trip well planned and I made sure to have all she asked for available. Her requests were few and very much within reason. She cared for the apartment as though it were her home and the space was left in an immaculate condition. I must make mention of her thoughtfulness, as she kindly left a beautiful novel for future guests to read and enjoy. Thank you and you are invited to return. It was a pleasure hosting you. Hope to see you soon. My wife and I rented this apartment for 1 week over new years 2019. It was a fantastic experience and Patricia was an amazing host. 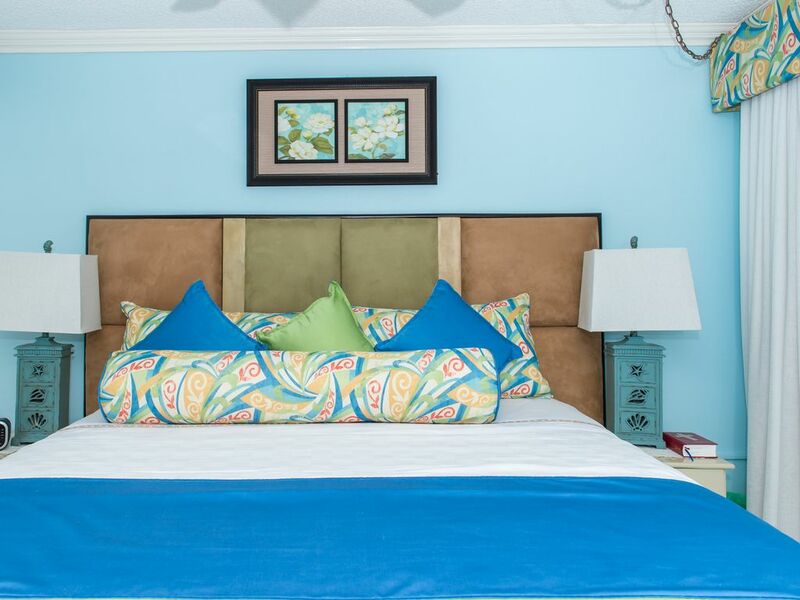 The apartment itself is located inside a lovely secure condominium complex just across from the Hard Rock hotel and next to the yacht club. Inside the apartment is very cozy and stocked with every amenity you would expect from a nice self catering flat. Throughout the duration of our stay Patricia was very attentive and really helped solve any little issue we may of had. Infact one morning she surprised us with fresh passion fruit juice after we had remarked earlier in our stay that we couldn't find it locally which was super appreciated! Anyhow, can't say enough good things about the quality of the apartment and the wonderful Jamaican hospitality we experienced. Would highly recommend the apartment to anyone who are looking for a lovely, quiet, secure and affordable self catering apartment in Montego Bay. Thank you Joe, it was a pleasure hosting you both, please come again. You kept the space clean and observed all the rules, you are the guest most host are looking for. We really enjoyed our stay. The apartment had everything we needed and Patricia was very welcoming and had good resources and ideas to help us enjoy our visit to Jamaica. We particularly liked the large pool which was empty most days when we used it. The apartment was safe and quiet and we liked that we could walk to the Hard Rock Café and the Yacht Club for meals. We booked excursions through the Sunscape Resort across the road and this worked out really well. You need a car to get groceries or shop or could take a taxi which were plentiful around the area. I would definitely recommend this accommodation for a relaxing visit to Jamaica. Thank you Jim and Janet, I thoroughly enjoyed hosting you both. You made it easy and showed so much appreciation for the small gestures. The housekeeper had excellent reviews of how you kept the apartment spotless. I enjoyed our conversations, your warm and inviting personality and take this opportunity to say please come again, my doors are open to you. I can honestly say with folks like you hosting is now fun time. Os visitantes podem fazer uma viagem à praia de Negril e nadar em Dolphins Cove com os golfinhos. Isso exigirá o seu ônibus de direção / turismo. Para fãs de golfe, existe o Clube de golfe Rose Hall. Os folhetos são colocados no apartamento para que os hóspedes tenham uma idéia das muitas atrações na área de Montego Bay.